As a part of the social program of ICSE 2018, we offer a morning run on Thursday, May 31. We start rather early, at 6:45 sharp, so that you are back at the conference on time! We meet 6:45 at tram stop Bögatan. 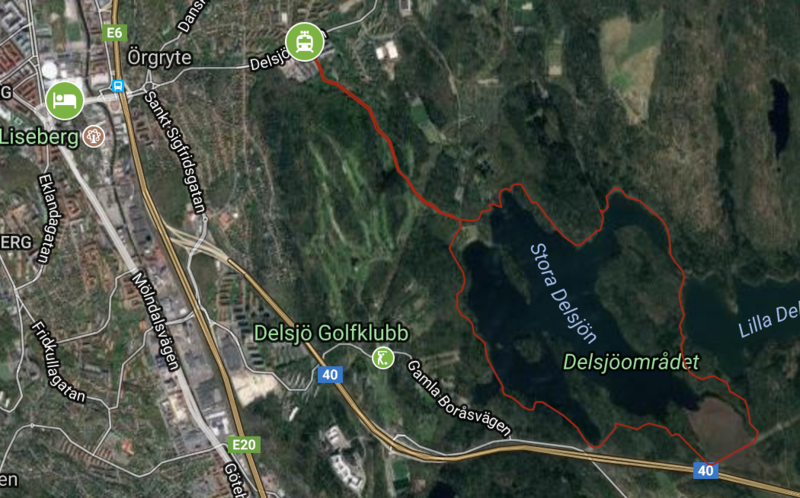 To get there, take Tram 5 from Liseberg (around 6:30) towards “Östra sjukhuset” and get off at the fourth stop (Bögatan). News: We will offer both a 10km version (described below) and an easier 5km version, so that also people who are not quick enough for the 10km version have an option to join! Please sign up here if you want to participate! The distance will be somewhat shorter than 10km, but the track is rather hilly. We will try to be back at the tram stop at 8:00. If needed, we turn around earlier to make it on time. The plan is to run at roughly 5:30min/km (approx. 9min/mile). Please indicate in the sign-up if you want to participate, but don’t run as fast. In that case, we will try to come up with a second option! You can find a map of the track here, and an elevation profile of the run below. The run goes all the way over gravel/dirt paths, through the forest and along a beautiful lake! You can find more information along with some pictures of the area here.